Bank Sella Holding SPA hosts SELLALAB in its headquarters in Lecce, a Fintech and digital startup accelerator which monthly organizes innovative events and training courses with the aim of spreading and raising awareness of digital companies in the digital transformation process, promoting Banking products, and encouraging the encounter between digital professionals and curious students. All events and training courses were promoted through the Beecode platform and have been very successful in terms of participation. In particular, human2human communication has enabled over 500 contacts in less than 5 months. Salentauto SPA is the official concessionaire Renault and Dacia in Lecce, and organizes periodic events, presentations of new models and test drives to promote its car park, a consolidated practice at many retailers. In this case, Salentauto SPA uses Beecode, making full use of its potential. 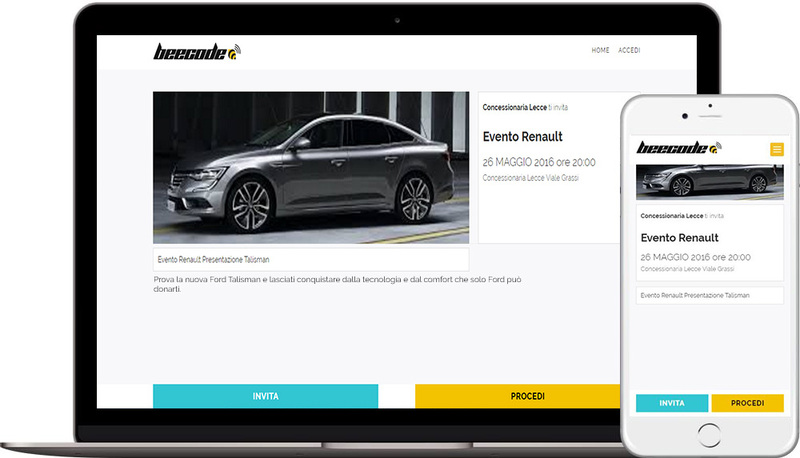 Beecode as a platform for promotion has made it possible to reach a wide audience of users who participated in the events and made purchases at a dealership. 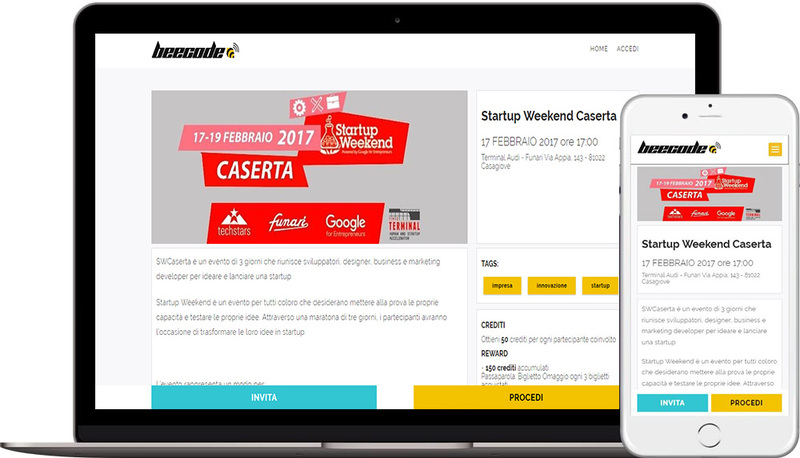 Startup Weekend Caserta is a three days event that brings together developers, designers, business and marketing experts to design and launch a Startup. An innovative promotion tool for an event whose goal was to promote and foster innovation. A perfect blend to which a wide audience of audiences has responded: over 200 participants in the Beecode-registered initiative. “Conversations about the Future” is a local events program linked to the American TED format organized with the aim of spreading value ideas within the local community. 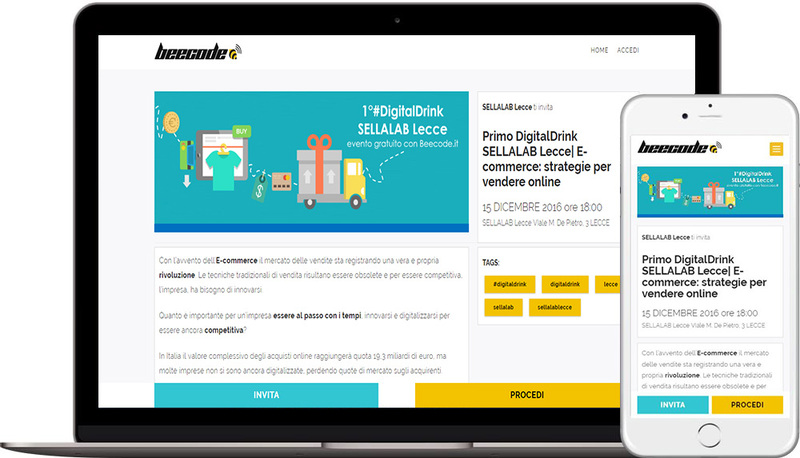 During the 2016 edition, SELLALAB Lecce hosted workshops and events whose central theme was innovation in enterprise. The events were promoted through the Beecode platform and in just three days they recorded a volume of about 300 people who took part in the initiative. The Riobò Discoteca is the flagship of Puglia's nightlife. During Summer 2016 some of the most important events were promoted through the Beecode platform. 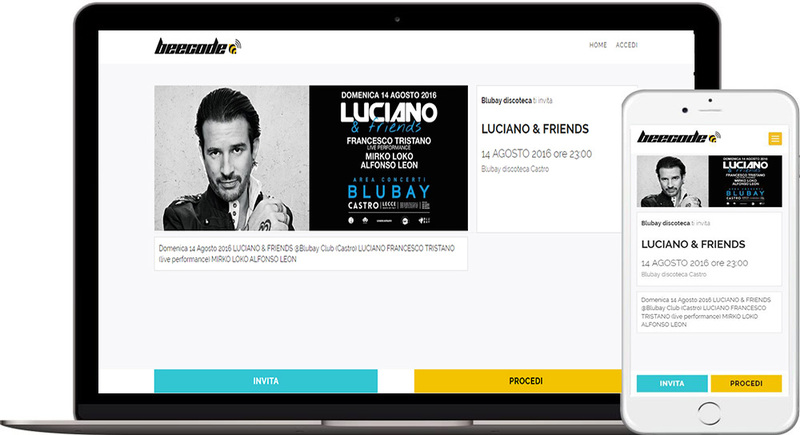 Thanks to the use of Beecode, the disco has been able to streamline disco access by reducing waiting files, drastically reducing paper waste by using the QRcode on mobile devices to access the event, roughly profiling 3000 users in 3 months. Grand Hotel Tiziano has organized 2016 New Year’s music event hosting Reboot, an internationally renowned Dj. The event was promoted through the Beecode platform and has had a great audience success: over 1000 participants. Augustus Resort in Santa Cesarea Terme is one of the most exclusive location of Salento. In summer 2016 an event called “White Party” took place. The initiative was designed and promoted through the Beecode platform. The event was very high and a target clientele both on the initiative and with the host structure. The BluBay Club of Castro Marina is one of the most fascinating discos in Lecce, a trendy location with pool, restaurant and air concerts. 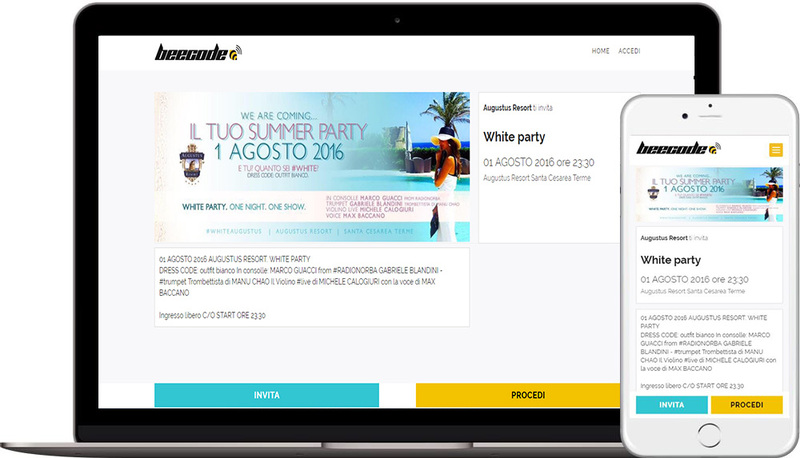 In summer 2016, there were many events promoted through the Beecode platform. The use of Beecode has reached a large number of people. Namely, there were over 4000 people who had access to the disco with Beecode.